The book is largely based on reporting by Miller and other staff writers at the Washington Post and includes interviews with hundreds of U.S. and foreign officials. The endnotes also credit reports published in The New York Times, Fox News, The Guardian, Forbes, New Yorker, NBC, and Facebook ads released by the House Intelligence Committee. Miller also cites books such as Hillary Clinton’s What Happened; James Comey’s A Higher Loyalty; James Clapper’s Facts and Fears; and Ben Rhodes, The World As It Is (reviewed at NYJB earlier this year). Thus, most of the story is by actors “inside the Beltway.” There are no foreign language sources and just one reference to a Russian publication, the somewhat independent Moscow News now published online in English. A careful reader of all these sources would find little new in The Apprentice. But the reader will find an integrated synthesis—a solid account that goes back many years to get elements of a full picture. Miller offers little in the way of deep analysis, but he provides many facts from which the reader can draw his or her own conclusions. But there is a qualitative difference in the kind of “he said this and that” reported by Miller and the assembly of cancelled checks and receipts published in The New York Times, October 2, 2018: “Trump Engaged in Suspect Tax Schemes as He Reaped Riches from His Father.” The “last word” is yet to be heard, including the findings of Special Counsel Robert Mueller. Miller says that Russia preyed on America’s supposed strengths—its openness, technological prowess, and internet dominance—sometimes so brazenly that the Kremlin seemed to taunt the last supposed superpower. Miller’s reports suggest the parameters of Russian intervention in the 2016 election. When Russia’s Translator Project asked Facebook to single out American adults with interests in “Independence or Patriotism,” Facebook delivered the ad 529,205 times and charged its Russian client 331,676 rubles—more than $6,000. Another Russian message was “shared” in people’s newsfeeds 340 million times. Seeing their failure to cope effectively with the Russian attack, Obama administration insiders felt a devastating sense of failure. Having traced what Trump people said over time regarding the August 2016 meeting in Trump Tower between his aides and several Russians promising dirt on Hillary, Miller can spotlight the inconsistencies including Trump’s ghostwritten claim that the meeting was primarily about adoptions to his August 5, 2017 assertion that the meeting sought to get “information on an opponent, totally legal and done all the time in politics.” Miller says that early in his presidency Trump made about five false or misleading statements per day. By summer 2018 the number exceeded 15. 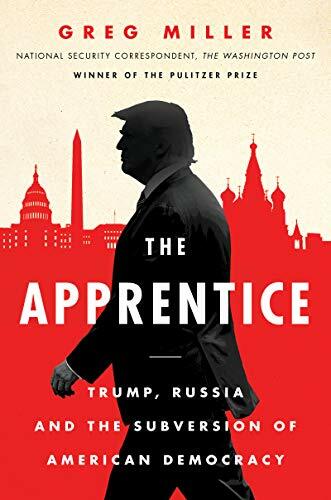 The second to last page of The Apprentice asks us to imagine that national security agencies uncovered secret communications between a political candidate and a foreign adversary. They included praise for that country’s authoritarian leader and requests for campaign help. Next came evidence that the adversary launched operations that affected every aspect of the election. Once elected, the candidate demanded that efforts by the CIA, Justice, and Congress to uncover what happened be shut down. All this took place in 2016–2018—much of it in plain sight. Implicit in these stories about the near treasonous activities of a U.S. president is the corruption of most Republicans in Congress and the myopia of Trump’s base.